Except for the single grain baby cereals we purchase, I've been in the habit of making everything my son eats. Armed with a blender and immersion blender, plus some baby food trays, making purees is a snap. More on some of my favorite blends at another time, perhaps. Point being, I love knowing exactly what he's eating and find it rewarding to make things he enjoys. I had noticed a recipe for teething biscuits in The Fannie Farmer Baking Book by Marion Cunningham (a treasure of a cookbook, if you can find a copy) and thought they might be the perfect treat for my little droolster. The slightly sweet and nutty whole wheat dough made some yummy treats indeed. 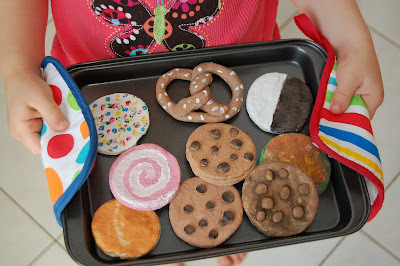 Preheat oven to 350 degrees F. Use ungreased cookie sheets, or line with parchment or Silpats. Put the egg in a large mixing bowl and beat well. Add the honey (or applesauce) and sugar and blend. Add the salt, soy or AP flour, wheat germ, dry milk, and whole wheat flour, and mix thoroughy, kneading the dough if necessary to blend well. Dust a working surface and your rolling pin with whole wheat flour, and roll the dough into a rectangle about 9x12 inches, and about 1/4 inch thick. Trim the edges neatly and cut the dough into strips 1 inch wide by 2 1/2 inches long (a dough scraper works great for this). Place the biscuits on the cookie sheets about 1/2 inch apart. Bake for 7 minutes until just colored on the bottom. Turn them over using a spatula and continue to bake for about 4 more minutes. Remove from the tray and cool on racks. Store in an airtight container. Please supervise little ones while they enjoy these. Teething biscuits do not dissolve as easily as puffs or Cheerios, which makes them perfect for gnawing on but also could present a choking hazard.